The Gunners were held to a 0-0 draw by Sporting Lisbon at the Emirates. Welbeck is comforted by Nani. ARSENAL BOOKED THEIR place in the Europa League knockout stages after a 0-0 draw with 10-man Sporting CP that was marred by an injury to Danny Welbeck. The point – combined with Vorskla losing 1-0 to Qarabag – was enough to ensure a top-two place for the Gunners in Group E, but the performance left much to be desired. A lack of fire power meant the few openings the Gunners were able to create went begging, while Sporting – who had Jeremy Mathieu sent off late on - offered even less in the final third. With Arsenal progressing despite a disappointing display, Welbeck’s injury will be the main concern for Unai Emery and Gareth Southgate, who named the 27-year-old in his England squad earlier on Thursday. Chances were at a premium in an opening 45 minutes dominated by Arsenal, the Gunners unable to turn their 69 per cent possession into clear-cut chances. It was a half soured by the nasty-looking injury to Welbeck, the forward having landed awkwardly on his right ankle after meeting Stephan Lichtsteiner’s right-wing cross. 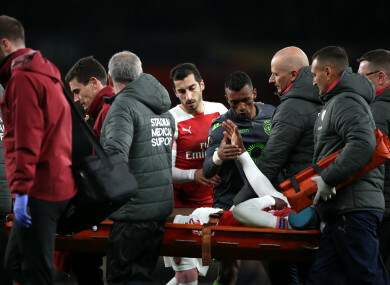 After receiving oxygen and medical attention on the pitch, Welbeck left the field on a stretcher, with Arsenal waiting to learn the full extent of his injury. Pierre-Emerick Aubameyang – the man who replaced Welbeck – went close straight after the restart, but the striker was unable to guide Henrikh Mkhitaryan’s cross on target. There was little to get the pulses racing after that 46th-minute effort until Mkhitaryan’s weak shot with 10 to play, Renan Ribeiro getting down easily to claim. Mathieu’s dismissal for a mistimed last-ditch tackle on Aubameyang offered Arsenal the chance to seal a dramatic late victory, but the substitute blazed over the crossbar in an effort befitting this lacklustre spectacle. Email “Arsenal held by Sporting in Europe but progress as Welbeck suffers serious-looking injury”. Feedback on “Arsenal held by Sporting in Europe but progress as Welbeck suffers serious-looking injury”.